Bite into this irresistible dessert! 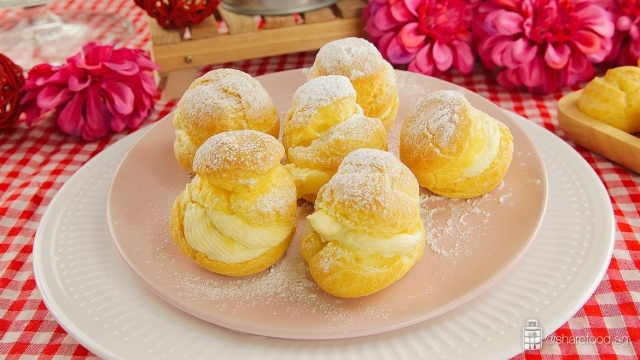 Rich and creamy durian filling perfectly matched with the delicate choux pastry. 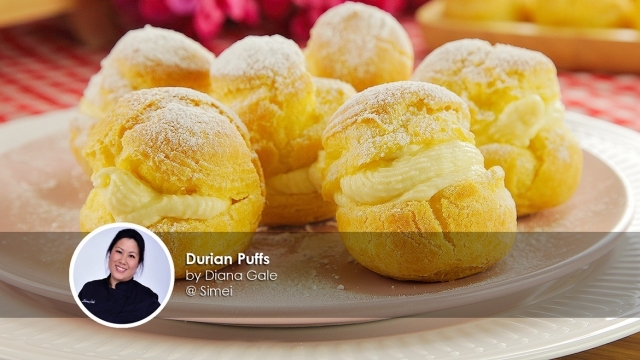 This Durian Puff recipe is shared by Diana Gale, a passionate home cook and writer of recipe books such as her latest book release The Domestic Goddess Wannabe Bakes. Generously pipped durian filling with soft pillowy choux pastry! 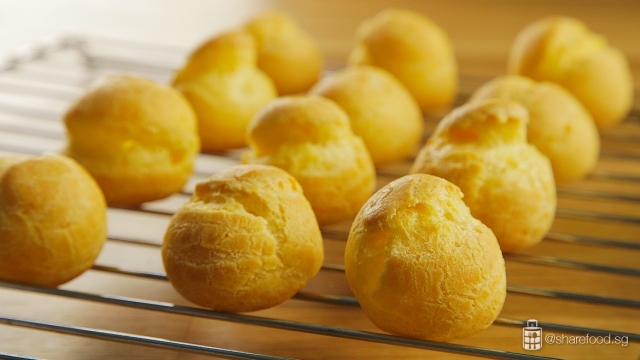 In this recipe, we share the simplest steps imaginable to bake the perfect durian puffs. Let's start with the cream. For the cream filling, beat the cream and icing sugar till it peaks. 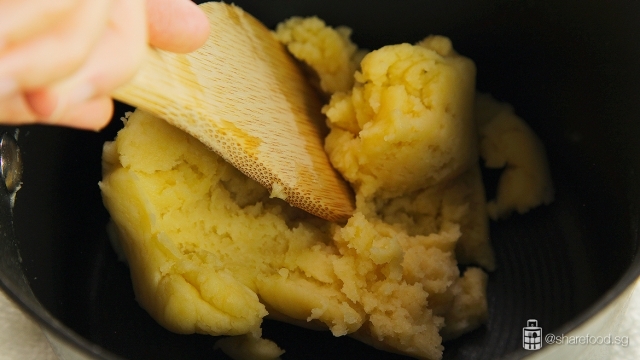 Avoid overbeating as the cream will curdle and fold in the durian pulp gently to prevent deflating the mixture. For the cream filling, beat the cream and icing sugar till it peaks. When making the choux pastry, precision is key. 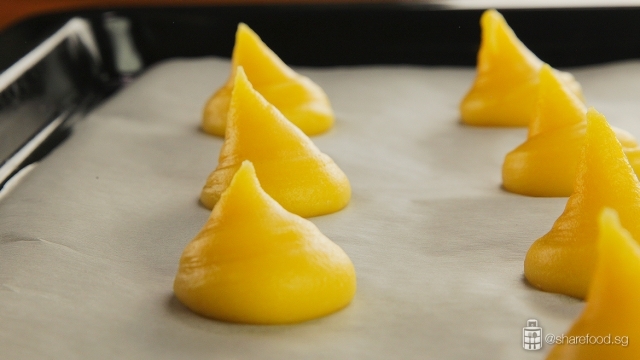 You need to measure the ingredients carefully and this will ensure a gorgeous and delicate choux every time you bake. In a heavy bottom saucepan, constantly stir until the dough pulls away from the sides of the saucepan and forms a thick smooth ball. Pour ½ portion of egg into the dough and mix with a wooden spoon until the dough is smooth. Bake till the puffs turn golden brown and are hollow. Pipe a generous amount of rich and creamy durian filling into the choux pastry and it's ready to be served! These are so irresistible, you simply can't stop at one. 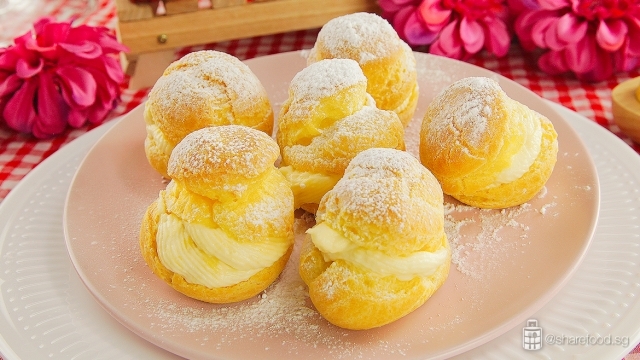 Rich and creamy durian filling perfectly matched with the delicate choux pastry. Chill a mixing bowl in the freezer for 30 minutes. Place the cream and icing sugar into the mixing bowl and beat until soft peaks form. 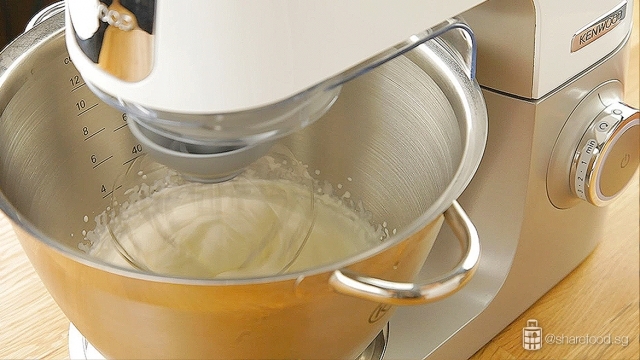 A tip to this step is not to overbeat the cream as it will curdle. Fold in the durian pulp gently to prevent the cream from deflating. Cling wrap and keep chilled in the refrigerated until needed. In a heavy bottom saucepan, add in butter, sugar, salt and 120ml water. Stir with a wooden spoon. Bring the mixture to a boil. Remove from heat and add in flour. Stir the flour till it is completely incorporated and the mixture is smooth. Place the saucepan on the stove, stir constantly till the dough pulls away from the sides of the saucepan and forms a thick smooth ball. 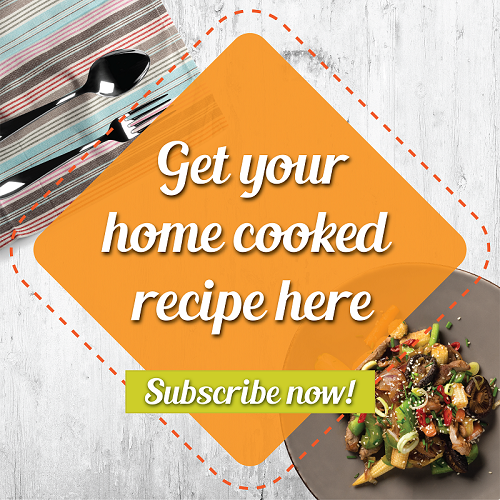 Transfer the mixture to a mixing bowl and let it cool to room temperature. Crack 2 eggs in a small mixing bowl, beat. 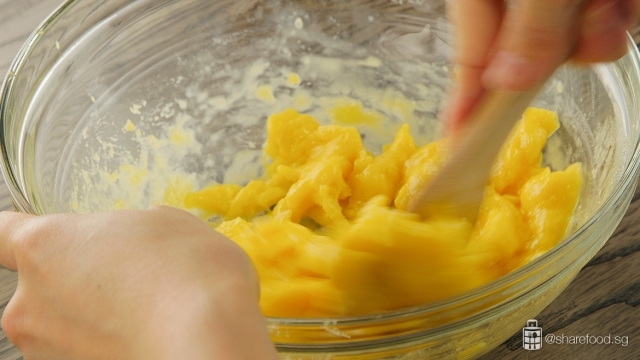 Pour a ½ portion of egg into the dough and mix with a wooden spoon until the dough is smooth. Gradually add more beaten egg and mix it till you achieve a thick consistency. Be careful not to over mix the egg as the mixture will become too watery to be piped. Scoop the dough into a piping bag fitted with a round nozzle. Pipe 12 even-sized balls onto the lined baking tray. Bake in the oven for 25 minutes. Remove the puffs from the oven and poke holes in each puff to release the steam in the puffs. Place the puffs back into the oven for another 5 - 10 minutes until the puffs turn golden brown and are hollow. Transfer the puffs to a wire rack and leave to cool. 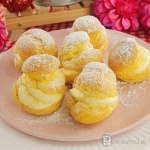 Fill the piping bag fitted with a smaller piping tip with durian cream, and pipe a generous amount of cream into the puff. Dust with icing sugar as garnish and ready to serve.